Президент Польщі — глава держави Польща. ↑ (англ.) Poland // The World Factbook. — Washington, D.C. : Central Intelligence Agency, 2017. — 23 квітня. — Дата звернення: 21 лютого 2017 року. — ISSN 1553-8133. ↑ (англ.) Poland // Chiefs of State and Cabinet Members of Foreign Governments. — Washington, D.C. : Central Intelligence Agency, 2017. — 23 квітня. — Дата звернення: 21 лютого 2017 року. ↑ President of the Republic of Poland / President / Polish Presidents / Gabriel Narutowicz. www.president.pl (en). Процитовано 2017-03-27. ↑ President of the Republic of Poland / President / Polish Presidents / Stanisław Wojciechowski. www.president.pl (en). Процитовано 2017-03-27. ↑ President of the Republic of Poland / President / Polish Presidents / Ignacy Mościcki. www.president.pl (en). Процитовано 2017-03-27. ↑ President of the Republic of Poland / President / Polish Presidents / Bolesław Bierut. www.president.pl (en). Процитовано 2017-03-27. 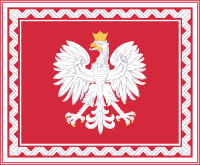 ↑ President of the Republic of Poland / President / Polish Presidents / Wojciech Jaruzelski. www.president.pl (en). Процитовано 2017-03-27. ↑ President of the Republic of Poland / President / Polish Presidents / Lech Wałęsa. www.president.pl (en). Процитовано 2017-03-27. ↑ President of the Republic of Poland / President / Polish Presidents / Aleksander Kwaśniewski. www.president.pl (en). Процитовано 2017-03-27. ↑ President of the Republic of Poland / President / Polish Presidents / Lech Kaczyński. www.president.pl (en). Процитовано 2017-03-27. ↑ President of the Republic of Poland / President / Polish Presidents / Bronisław Komorowski. www.president.pl (en). Процитовано 2017-03-27. ↑ President of the Republic of Poland / President / Biography. www.president.pl (en). Процитовано 2017-03-27. Дахно І. І. Польща // Країни світу: енциклопедичний довідник / І. І. Дахно, С. М. Тимофієв. — К. : «МАПА», 2011. — 608 с. — (Бібліотека нового українця) — ISBN 978-966-8804-23-6. Poland : [англ.] // World Statesmen.org. Цю сторінку востаннє відредаговано о 21:41, 4 грудня 2018.